“INVASION USA” – no, this post isn’t about Whoopie Goldberg almost playing the female lead, or what happened to the carefully crafted story that was in the original screenplay, or how the movie got made in the first place – we’ll get to those in later posts. So, towards the end of production on the film, I got this frantic call from Cannon Films asking me to immediately fly down to the Atlanta location to rewrite the ending of “INVASION USA”. I naturally asked them why the ending needed to be rewritten from my final draft of the screenplay. I had been on the location scout with director Joe Zito and had tailored the script to work on the fabulous locations that Joe and his team had discovered. I was told the rewrite was needed because the ending had been changed while the movie was in production and they suddenly realized that the new “improved” ending wasn’t going to work. In our humble opinion, making script changes on the fly during production without the input of the original writer is dangerous, both to the story and to the budget. A lot of changes happen during production because someone on the set says “Wouldn’t it be cool if…” – not realizing that the “cool” scene or dialogue effects story and character development both before and after the new material. A good, tight screenplay moves and flows a certain way and if you move or change even one element, you can throw the whole thing off. You can always make necessary changes work – an actor gets sick, you lose a location, etc. – but the person making the changes should first understand how each and every scene, and line of dialogue, works in the story. The original writer is generally the best person to handle the task. Of course, it helps if the writer can keep an open mind and has production experience. Okay, I’m getting off the soapbox now. Elizabeth and I flew to Atlanta. We watched some really spectacular action being filmed and I got filled in on where things stood and was told how many days were available to shoot the ending, and what location was available. While I was rewriting (BTW – don’t tell anyone, but as usual, Elizabeth secretly helped. This is before we made it official and partnered up as a writing/producing team. ), a scene was filmed where helicopters flew over the city of Atlanta and dropped leaflets telling inhabitants that there had been a terrorist invasion and that they should stay inside until further notice. I had written the copy for the leaflet and didn’t think anything more of it. 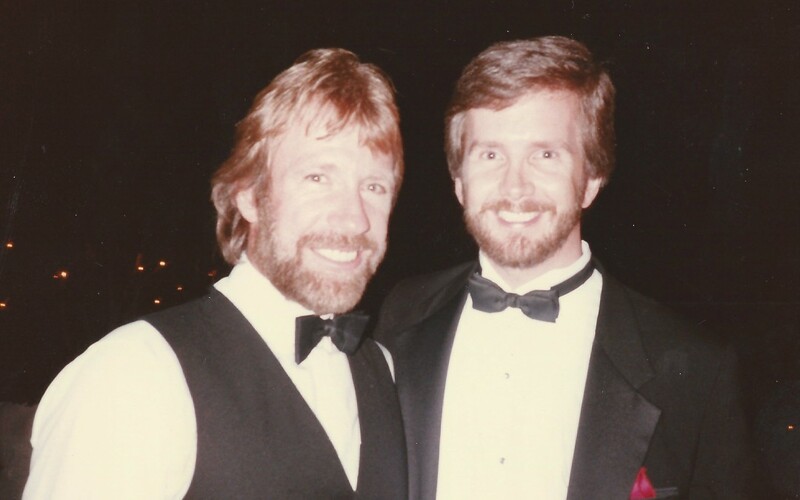 Elizabeth and I were in a limo with Chuck Norris on the way to dinner one evening a few days later. Chuck seemed upset, so we asked him what was wrong. He told us that he had just heard something that really made him mad: one of the helicopters had dropped the warning leaflets on the neighborhoods surrounding the location – other than the litter, not a big problem, right? Wrong. So three days went by and the police got a phone call from three little old grandmas asking if it was safe for them to come out of their basement yet…They had picked up a leaflet, thought the warning was real, and had hidden, terrified, in the basement for three days!